Our fears and doubts can sometimes overwhelm us. But we are creative beings and have incredible potential. 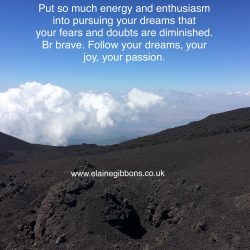 Pursue your dreams with so much vigour and passion that your fears are quietened down. Each day, work towards changing your life in a positive way in the direction of achieving your dreams. This might be doing some reading around areas that inspire you. Talking your ideas through with a good, supportive friend. Going for a walk to clear your head. Having a nap to renew your energy. Doing a guided meditation to rebalance your energy field. Acknowledge your fears and doubts. Write them down. Then let go of them. They are part of being a human being. Everyone who has ever achieved anything has fears and doubts. But to move forward you have to not let your fears rule your life. Be brave. Listen to your inner yearnings. Do what makes you happy as often as you can. Life is short. Enjoy yours!